After relaxing at the beach for several days in Fiji, you might be looking for some ways to get your adrenaline going! We’ve rounded up some activities that are sure to do just that during your time in Fiji. You can choose from skydiving, parasailing, buggy riding, ziplining, and kitesurfing. Who says Fiji is just for those who want to relax? Skydive Fiji is the only skydiving operation in Fiji. 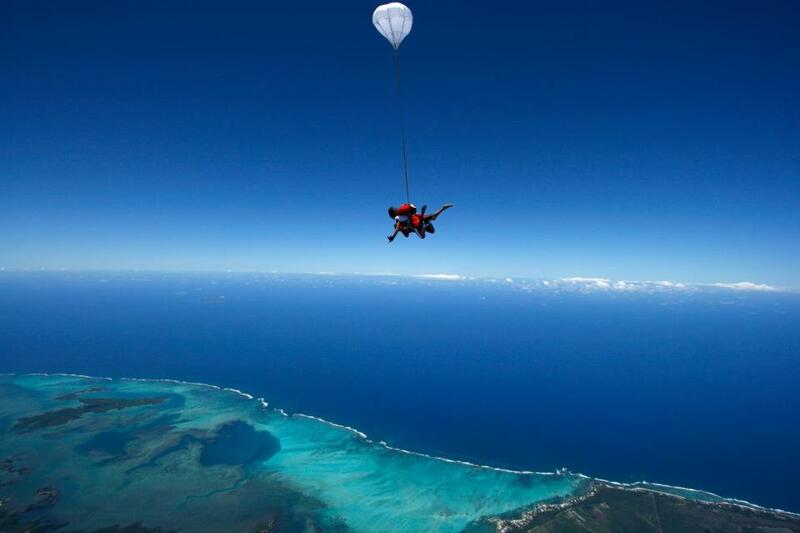 It offers tandem skydiving, which is probably the best introduction to the Fiji islands dotting the ocean. But skydiving after your relaxation time works too! No age is too old or too young for this company. Skydive Fiji’s youngest guest was seven, and their oldest was 92. The company operates out of Nadi, and participants jump onto Denarau Island. Participants can choose to jump 8,000 feet and free-fall for 15 seconds (minimum), jump 10,000 feet and free-fall for 30 seconds (radical), jump 12,000 feet and free-fall for 45 seconds (extreme), or jump 14,000 feet and free-fall for 60 seconds (legend). Once you have selected your free-fall time, you must make sure you remember to capture the moment with video and photos. Skydive Fiji has package options for both video and photos to help you remember your experience. After your free fall and parachute ride down, you’ll be rewarded with a big “bula” and a certificate of attainment. A fun, action-packed off-road adventure lies in the buggy and quad tour by Go Dirty Tours. The 1000cc buggy seats four people and treks to the interior of Fiji. The buggy will venture through mud puddles and across rivers. During the calm periods of the tour, you will listen to the stories of your tour guide and driver. After three hours of fun, the tour ends with a unique hose shower. Go Dirty Tour: Guests are picked from their hotels and brought back to Nadi for a briefing before getting on a buggy and taken up to the mountains. Snacks and soft drinks are included. Go Trek Tour: Guests are picked from their hotels and brought back to Nadi for briefing before getting on a quad bike and taken up to the mountains. Snacks and soft drinks are included. Mud Pool Tour: Guests are picked up from their hotels and brought back to Nadi for a briefing before getting on either a buggy or a quad bike and driven to the mud pool in Sabeto where they are pampered by mud. Lunch is included. Zipline Tour: Guests are picked from their hotels and brought back to Nadi for briefing before getting on either a buggy or a quad bike and driven to the Sabeto Zipline. Lunch is included. Adrenalin Fiji offers a variety of water sports and adventure activities, including parasailing. Anyone can brave the skies for a blissful 10-minute ride, looking over Fiji’s blue waters and white sandy beaches. Participants will be harnessed to a chute and elevated into the air while being towed by a boat. Soar above Denarau Island and enjoy the views of the Mamanuca Island Group. Tandem or solo options are available. Located at the northern tip of Taveuni, Kite Fiji is the top kiting spot in Fiji. The company has an IKO-certified instructor and all the gear that will get you ready for your lessons. If it’s your first time, you will learn to kitesurf in an easy, beginner learning area with shallow water where you can stand up and regroup whenever you need to. You can also use the school’s 43-foot catamaran to escape to a world-class surf break for a full advanced session. You can even head out to the hidden Lau Group for a week of kitesurfing in remote areas. The kite beach is protected by a reef and has butter flat water and two islands on either side to boost the wind speed a bit. You can stand up anywhere in the kiting zone, so no more yard sales and trying to get all your gear back on while floating downwind after a crash. It’s also the perfect place to advance your skills with the help a certified instructor.